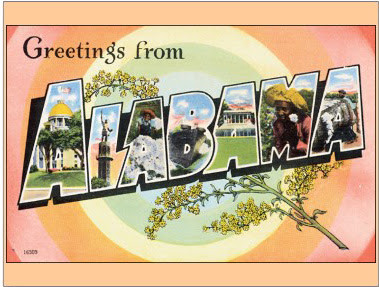 Alabama is located on the equator. Don't bother looking it up. Just trust me on this one. This is in no way a complaint, but coming from 40 degrees in NYC to 80-90 in Mobile, Alabama was quite a shock to my system. I had forgotten that it was possible to sweat while sitting still. Beyond being sticky and gross for the majority of the weekend, it was glorious. I finally got to break out my new sandals! I seriously had second thoughts about returning to the chilly Northeast. Alabama has bugs the size of small birds. The mosquitoes will attack you in Hitchcock-esque swarms unless you slather yourself in chemicals every 20 minutes. I stand behind the claim that I have sweet blood and that's why they enjoy my company so much. Alabama is full of trees and flowers and grasses. This contributes to a beautiful landscape and sneezing, itchy eyes, and a sore throat. This weekend reminded me of my allergy issues which rarely bother me in the relatively barren city. I will be recovering from a pollen overload for the next few days. Time operates differently in the South. Everyone takes a more leisurely pace which is typically 15-30 minutes slower than the rest of the world. All the wedding activities for the weekend ran a little behind schedule. But you know what? It all worked out fine. A lovely couple got hitched and had a great time with friends and family. Promptness is so overrated. Tons of pictures and tales of the weekend are coming soon! Uhm, if I recall correctly I coined that phrase "Alabama has bugs the size of small birds."